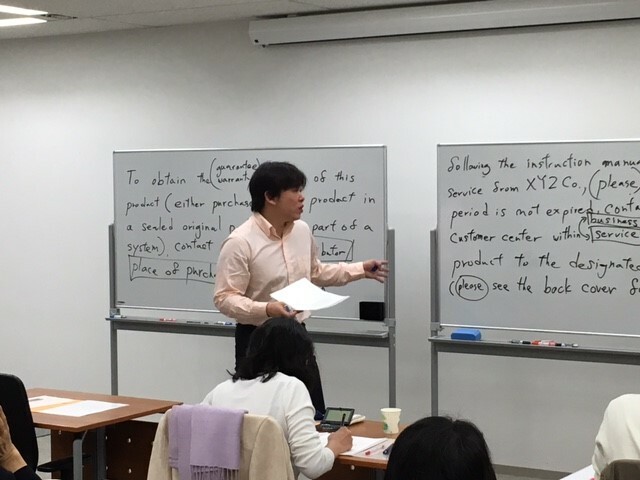 In the seminars, either hand-made or carefully modified Japanese passages that include important lexicogrammatical features and expressions frequently seen or used in the first and second grades of the Kogyo-Eiken Test, specifications, business emails/documents, or industrial translation--depending on the theme of the particular seminar--are used as English writing tasks. The features and expressions taken up in the seminars are accepted and acknowledged worldwide as the preferred style in the formal documents in the English language. Participants with a mastery of these tecniques, therefore, will have a definitive edge, and will be more confident in your daily writings. Writing in English, I believe, is certainly not a mechanical, word-for-word, laborious process; quite the contrary, it is inherently creative and original, and becomes more so as the linguistic distance between the original and the target language widens--look no further, Japanese and English. Coupled with an easy-going and jovial atmosphere, the seminars are worth attending if you want to improve your English writing skills. Since both Japanese and English are equally important, the two languages will be evenly used during the seminar hours. Looking forward to seeing you soon.